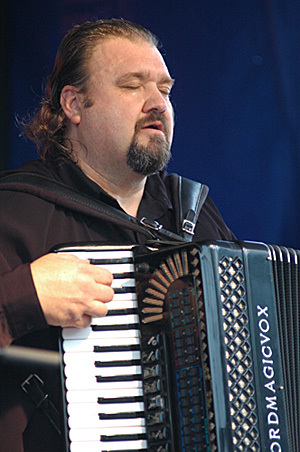 Son of Stefan Sernek Senior, a humble carpenter from Slovenia, Stefan Jr was confined to a life of cabinet-making & Bavarian oom pah-pah accordion playing - that was until he heard the rockin' sounds of buckwheat zydeco pulsating from his radio. The Alpine Echo's were promptly disbanded & Psycho Zydeco was conceived. November 89' was the start of a new musical education for me. Clifton Chenier, Boozoo Chavis, Rockin' Dopsie & Queen Ida were early influences, followed by Terrence Simien & Beau Jocque. "Finally I found a home for the squeeze box that was blues based & cool to play". Stefan embodies the phase "bon temps roulet" - let the good times roll - with living life to its fullest. Along with his psychotic squeeze-box playing he keeps the bands bottom end pumping along with the help of an old analogue bass/organ set up, all triggered from his left hand. He builds kitchens like a maniac, owns the Zydeco van & has a passion for movies with cajun/zydeco sound tracks. Also from the Zydeco school of cabinet making, Gregg put on hold his Neil Young ambitions & formed Psycho Zydeco with Stef after they met on the factory floor in the early 90's. Gregg has a love for vintage guitars and amps. "The older and more worn they are the better in my opinion. There is a reason why a guitar or an amplifier has been used that much, and it's usually because it's a great one. These instruments have seen so much whilst they've been played all over the world at 1000s of gigs and I'm just continuing their journey along. When he is not Zydeco-ing, he is either managing and booking the band, restoring his old house in Summer Hill or working on someone else's old house. Classical, Funk, Rock, Jazz and the music of Frank Zappa are all musical joys, but for Chris performing live is the best. "The success of our overseas tours along with the evolution of our recordings is something I'm proud of as well as our live show. While I love to see our fans at gigs, to win over a first time audiences is always a thrill. We are in a good space right now in the history of Psycho Zydeco and I look forward to recording some new stuff. We have come down a long road, but I gotta say we still love playing our show, and letting people dance-just making them happy." These days Gene is extremely busy studying engineering as well as helping to look after his two kids. 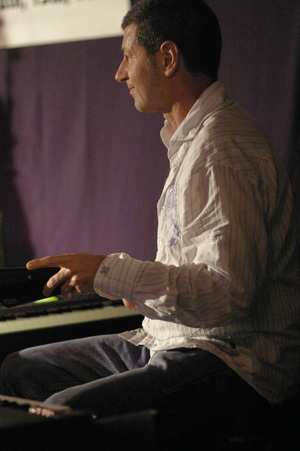 We often use George on big stages to fill out our sound with his amazing Hammond organ and piano playing. Hailing from Maroubra via Alexandria, Egypt and Athens, Greece, George has joined Psycho Zydeco with the express purpose of eating Cajun food and meeting gorgeous southern belles. Having failed miserably on these two counts he has committed himself to adding some colour to the wonderful sound that is Psycho Zydeco with some fat warm organ grooves, piano and occasional frenzied beating of cowbells. A background in all sorts of roots music projects including country bluegrass exponents The Danglin Bros and lounge masters Astro Tabasco, George has taken to zydeco like Demi Roussos to kaftans. Sydney based Psycho Zydeco, or the Psychos as their fans affectionately dub them, have established themselves as the country’s premier roots act specialising in the high-energy, uplifting style of music known as zydeco. This music was originally born in the swamplands and bayou area of Louisiana’s Deep South. The band’s earthy blend of traditional Cajun, blues, and swamp music produces a heady mix of their brand of Zydeco. Driving washboard, drums, guitar, saxophone, organ, piano and the odd triangle combine with some amazing accordion playing to create music that will make you move. Since 2007 Psycho Zydeco have been performing with George Bibicos on piano and Hammond organ, this has led to a greater warmth and diversity in the band’s sound. George’s playing has helped create a fresh vibe amongst the group and has been embraced by fans as a great new addition to the wild ride that is Psycho Zydeco. With performances at every major music festival nation-wide, TV and radio appearances and three tours of the U.K. and Europe, Sydney based Psycho Zydeco are one of the most successful touring ‘blues/roots’ acts in Australia. All four of the band’s recordings, Swamp Box, Sell Your Soul, Zydeco Factory and Get On Board have been favourably received by fans and critics alike. Psycho Zydeco was formed in 1991 when accordionist Stefan Sernek and guitarist Gregg Hatton discovered the Louisiana based styles of Cajun and zydeco music. They assembled custom made instruments necessary for the zydeco sound, such as washboards and various triangles and combined them with the 'Squeezebox' and rhythm n blues guitar. 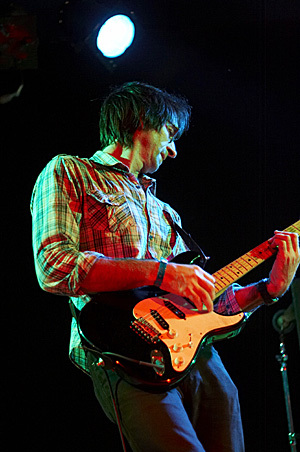 The group began performing In the Sydney area and slowly started to form a reputation as purveyors of a new and exciting foreign sound. 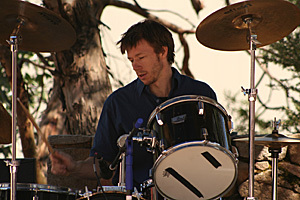 The band released its debut CD, SwampBox, in 1995 and had by then began to make regular appearances at folk, jazz, and blues festivals throughout the eastern seaboard of Australia. Although Psycho Zydeco displayed a leaning towards the rhythm and blues style of Clifton Chenier, Buckwheat, and Rockin' Dopsie, the group has shown a desire to also perform the more folk and Cajun styles complete with Creole French lyrics and ringing giant triangle. Despite their fascination with these American styles, the band believe the Psycho Zydeco sound has an undeniably Australian quality that is their own. In 1996 Psycho Zydeco received an Invitation to perform at the Edinburgh Jazz & Blues Festival, an extremely exciting prospect. After a great deal of organization and hard work a small tour of the UK was organized and embarked upon. A total of 17 shows were performed in 12 days in London, the Edinburgh Jazz Festival and at the Brecon Jazz Festival in Wales. The band received an amazing response to their music thus the tour was proudly deemed by the band a financial and creative success. Energized and inspired from the tour the band began rehearsals to write their second album. It was the group's desire to spend more time on this new project than was possible when recording Swamp Box. Recording began in late April 1997 and three studios and three months later the CD was complete. The intention of this project was to fully explore the possibilities of Cajun and zydeco based styles. The resulting recording Sell Your Soul, which is short for ‘Don’t Sell Your Soul To Zydeco’ delves into cajun style folk (Barragoot Swamp, Bogged in the Bayou, Boozoo's Yea Yea), blues (Sweet Little Angel, Evening Train) and high energy zydeco grooves (Amazon Annie, Hot Tamale Baby and Don't Dance). The album was completed just in time for the band to debut on their 27 date tour of the UK and Europe which took place during August 1997. This tour was enormously successful taking in the Edinburgh Fringe Festival, the Edinburgh Jazz & Blues Festivals as well as a performance for the Internationally syndicated BBC Radio program "The Usual Suspects". Festival performances in Belgium, Wales and The Greater British Blues Festival in Lancashire England comprised the remainder of the tour. On returning to Australia the group then concentrated on the promotion of their new CD through media appearances and interstate touring. They were guests on Nine's 'Midday Show', as well as Triple J's 'World Music Show, while the Sell Your Soul Tour has taken in Brisbane, Canberra, Sydney and Melbourne. At the end of 2000 Psycho Zydeco proudly announced the release of their third full length CD, titled Zydeco Factory. The band was finally able to emerge from their factory studio where they had written, rehearsed and recorded the long awaited successor to the groups previous two albums. Zydeco Factory explores a wide range of rhythms and grooves and is a potent brew of Australian style blues tinged zydeco. From Cajun instrumentals to steaming country grunge and rollicking zydeco funk, this album is an eclectic, spicy gumbo of all original songs. The Zydeco Factory Tour, supported by radio nationally on JJJ and the ABC, saw the band undertake an extensive tour of Australia. 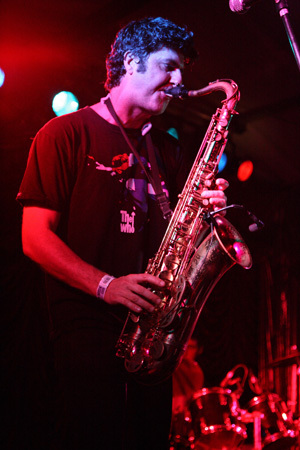 This included most major cities and many regional centres and featured concert performances sharing the bill with artists such as Paul Kelly and blues-meister Damon Davies. The band finished the 25 date tour in front of thousands of fans onstage at the Woodford Folk Festival bringing in the new year. A great way to finish an amazing year. In 2006 the band released their fourth album, “Get On Board”- a 16 track Psycho Zydeco time capsule spanning the evolution of this music from its rockin’ bluesy beginnings right through to the funkier style of zydeco nouveaux. For the first time the band was performing live with Chris Mawer on electric bass which freed Stefan from his extraordinary role as the accordion/bass player in Psycho Zydeco and ushered in a funky new groove in the band’s sound. On Get on Board we’ve recorded a bunch of original tunes as well as select arrangements of material that helps us tell the story of zydeco music. The new Psycho material shows the different sides that the band has developed over time. While songs like Zydeco Nights have an upbeat and happy Cajun groove, others such as the rollicking Surf Cowboy are a little wild and downright fun! If you haven’t seen the band live, this recording is pretty indicative of a Psycho Zydeco gig, capturing the band in full flight. The love of playing the music shines through when the zydeco machine gets up a full head of steam.